Shingles or herpes zoster is an infection which is characterise by a painful blistering skin rash. 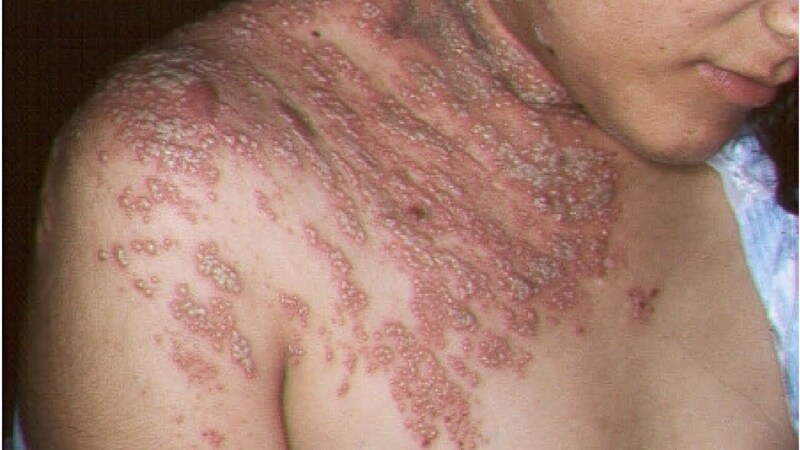 The rash usually affects one side of the body, i.e. the torso and/or one side of the face. It appears in a band formation and therefore the name ‘shingles’, which is Latin for ‘belt’. Shingles is caused by the same virus that causes chickenpox, called the varicella-zoster virus. The initial warning symptoms appear one to five days before the rash appears. You will feel the warning signs on the location where the rash will appear. These initial symptoms include itching, pain, burning, pricking and stabbing sensation, followed by high fever, chills and muscle pain. The tell-tale rash appears soon after. In this disease pitta dosha is responsible factor for eruption of reddish painful boils in the hands, armpit, shoulders, eyes and waist. Healthy people and young children too are not exempt from the risk. In fact, anyone who has had chickenpox is at a high risk of developing herpes zoster or shingles. Pain is the first feature of this, which may be moderate to severe. Patient feels fever, headache and uncomfortable. The lymph nodes draining the affected area may get swollen, enlarged and tender. The blister formation occurs in the painful area after two three days of the onset of pain. In children it may be painless. It moves as the path of nerve and new lesions continuous to appear for several days. Shingles occasionally causes blisters inside the mouth or ears and may also affect the genital area. The pain and the other symptoms subside gradually as the eruption disappears. This is the term used for persistent pain for more than month after the onset of herpes zoster. It is most common in the patients over 40 and those who have facial involvement during infection. Pain may be continuous and burning with increased sensitivity on the affected areas. According to Ayurveda Herpes Zoster is closely related to Visarpa. Mainly pitta dosha aggravates along with involvement of kapha and vata dosha. Rudraksha Ayurveda provides best combination of effective herbal preparation like Manjistha, Neem, kalmegh, Bhallatak,Shatavari which is excellent time tested anti viral activity, alleviate burning and inflammation in skin diseases resulting from aggravated pitta and rakta which is seen in Herpes zoster. An ayurvedic treatment has wonderful results in Herpes disease. It may cure permanently if patient follow the complete course of treatment with all diet, life-style & panchakarma like Raktamokshan which balanced aggravated pitta dosha in blood and make blood pure .